Communities across the U.S. and Canada experiment with different ways to keep fruit local. Surpluses of fruit in urban areas should go to the hungry instead of the ground, some say. A visit to the website reveals that my fruit is actually from some undisclosed location in the Northwestern United States, possibly near Seattle, where I grew up. Like me, my snack has made a 2,500-mile voyage to the East Coast. The journey down my esophagus and into my stomach was just the last ten inches of a long trip. As I finish off the last bites of the pear, I feel a tinge of guilt. Like many people concerned about fossil fuel consumption I am trying to eat more locally, to become more of a “locavore.” The term is based on the Latin words ‘locus,’ as in the word location and ‘vore,’ as in the word voracious. In other words, eating based on location—referably one that is close by. As concerns about fossil fuel-spurred global warming loom large, the idea is that eating foods grown closer to home will reduce the amount of fossil fuels needed to transport them. What sounds good in theory is not always easy in practice. Buying locally produced fruit in the city isn’t always a convenient option. The fruit that is available can be pricey, often excluding people with low income from purchasing it on regular basis. But now a movement growing in U.S. and Canadian cities is trying to bring fruit production much closer to home. People involved in the push have realized that growing and harvesting fruit in the city is often a better option than importing it from undisclosed locations around the globe. They are jumping to the front of the food chain to become producers, rather than passive consumers in the food supply. People involved in this movement say that growing and harvesting your own fruit goes hand-in-hand with a sense of community, that it is inherently a group effort. And beyond producing delicious, healthful snacks, they see fruit trees as a rallying point for building connections with neighbors next door and down the street. “Fruit trees were originally looked at as a nuisance by some city officials. They were never thought of as useful, but there is value in fruit. Our project has value to people,” says Gail Savina, director of the fruit harvest project for Lettuce Link, a non-profit food and gardening organization in Seattle. Her organization’s project, like others in Vancouver, Portland and several small cities in the Western U.S. and Canada, is based on the idea that property owners often grow much more fruit than they can ever hope to eat themselves. 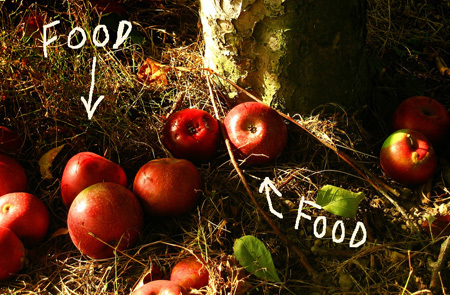 Rather than letting this food go to waste, volunteers, often in small groups of about 10 people, get together and harvest the fruit for the tree owners. And there is a lot more wasted fruit in Seattle than anyone had previously imagined. Although Savina’s Lettuce Link program is only in its fourth year, volunteers have pulled in a total of 14,500 pounds of fresh fruit. This past year yielded 75 percent of that figure, up significantly from the previous three years. Savina says that there are many more neglected fruit trees than volunteers to harvest them, and they probably passed over as much fruit as they took. And she thinks there is much more fruit out there. “We know there’s a lot! There’s tons . . . tons!” she says. The longer these types of projects are around, the more they seem to gather steam. In Victoria, British Columbia, a project that started as a group of “neighbors with ladders” in 1998 gathered 35,000 pounds of fresh fruit last year. These included apples, pears, plums, cherries, kiwis, quince, walnuts, grapes, figs and tomatoes. And that was despite unfavorable growing conditions.